55 Ft of dock NO FIXED BRIDGES. Space available on deep water and 100 wide canal. Twin 30 amp service. 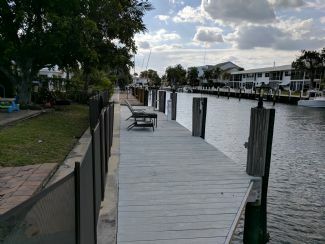 Oakland Park Blvd and Intracoastal and only 6 houses from Main intracoastal. Behind private home. Month to month contract only, but looking for long term rental. Home insured. Proof of current registration and insurance of vessel required for contract. Utilities will be charged based on usage after 1st month. No major repairs or shipyard works allowed. We are a nice young fun family looking for nice people to work with. No drama allowed please. Monthly Rate: $1,500 Mostly listings charge by "Flat Rate" per month.